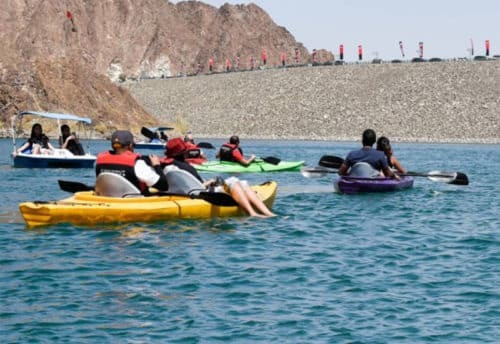 Experience the new and most exciting watersport , Fly above the water, find new sensation and enjoy swimming with amazing experience Flyboarding is the newest action water sport which is a foot mounted board connected to a personal watercraft via a 60ft hose. The output which would usually propel the watercraft is redirected to two jets on the bottom of the flyboard, creating lift. Do you want to fly out of the water and feel and enjoy like Ironman? Try flyboarding! If you have never done this activity before, don’t worry here Skyland tourism will give you some tips for beginners. 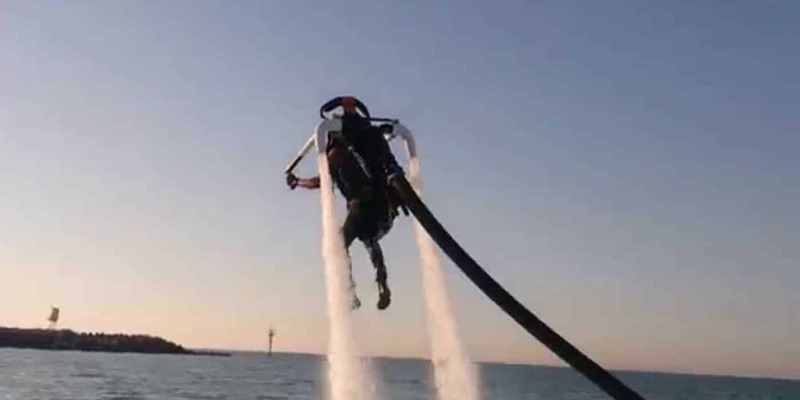 And later on Skyland Tourism also started to include flyboarding in its water sport activities. 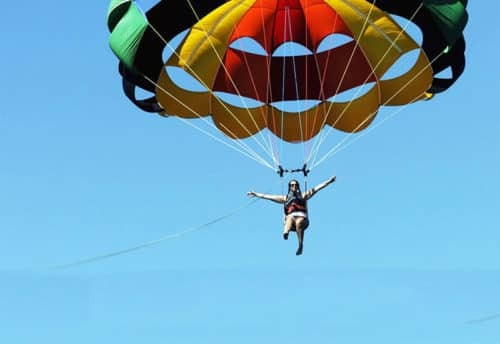 This fun and adventure sport is made taking care of your safety for you by skyland tourism, preparing you for the flight before the actual one. Flyboarding works like it is propelling above the lagoon with the help of water. 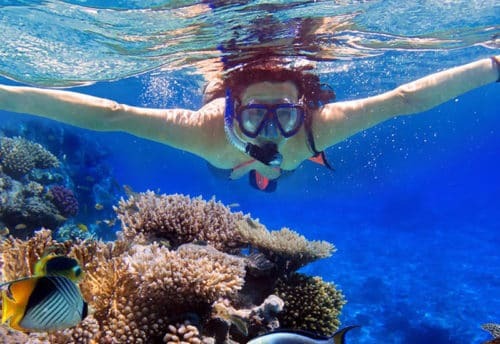 This sport appeals to those who already tried activities such as parasailing, scuba diving, snorkelling, wave running, etc. These tours for sure rush your adrenaline more than anything else. 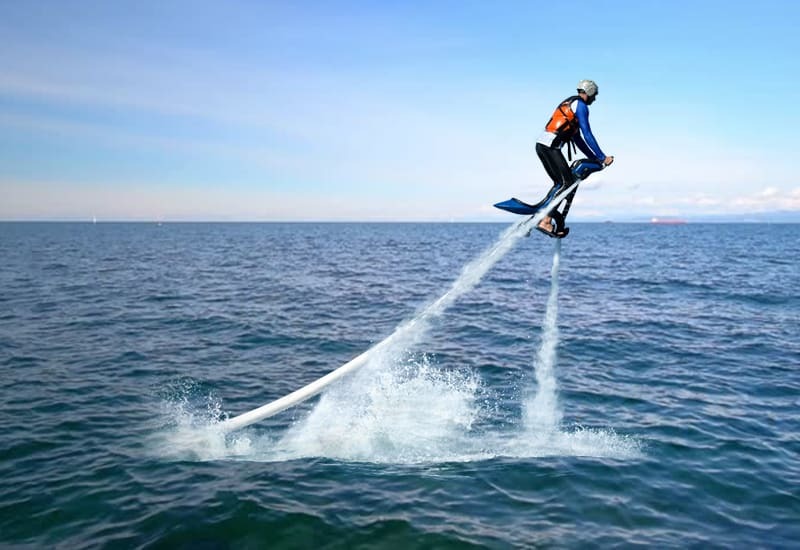 Why you should do flyboarding with Skyland Tourism? Well that’s because we guarantee complete fun along with safety. While flyboarding might seem very easy for some people, others might find it scary, but everyone considers it pretty exciting. But it’s not very difficult to learn. Skyland Tourism provides all the training, practice and information you need to have a great time flyboarding! Make sure to listen to what the guide says. Follow his instructions very carefully. Pregnant women and any person who is under even a slight effect of alcohol is not allowed to do flyboarding. The point is to have fun but not to forget about safety, it is always the most important thing so Skyland tourism gives its best to provide you a safe and memorable experience! High-tide and high wind speeds are the times when flyboarding should not be engaged or operate in. Beginners or experts, make sure you wear safety gears. These are not as cool to flaunt, but are a must to keep you safe. Tie all of the safety gears tight to the body like the body suit and the helmet. The most important are the boots pay attention to that. Before your start, Please make sure to be at a safe distance away from your wave runner. Maintaining the right balance is essential while flyboarding. You need to listen to the guide to know which is the right posture so you don´t lose the balance. Stand straight, with the help of your knees slightly bent forward, but never toward the back. Make sure your body and mind are relaxed when flyboarding for the first time don’t panic. Flyboarding is fun and once you complete it successfully you would like to try new pirouettes like an expert. Practice and enjoy as much as you can the basic level, get accustomed to it, get comfortable before moving to the next level. For some it might come as tough to maintain a balance when up in the sky but don’t give up. It will pay off! A Flyboard is a type of water jetpack attached to a personal watercraft which supplies propulsion to drive the Flyboard through air and water to perform a sport known as as Flyboarding. It will give you a unique experience in water. The board orientation is made by inflation. The height that can be reached is around 10 meters max. Flyboarding is not so difficult; one only needs balance and confidence. 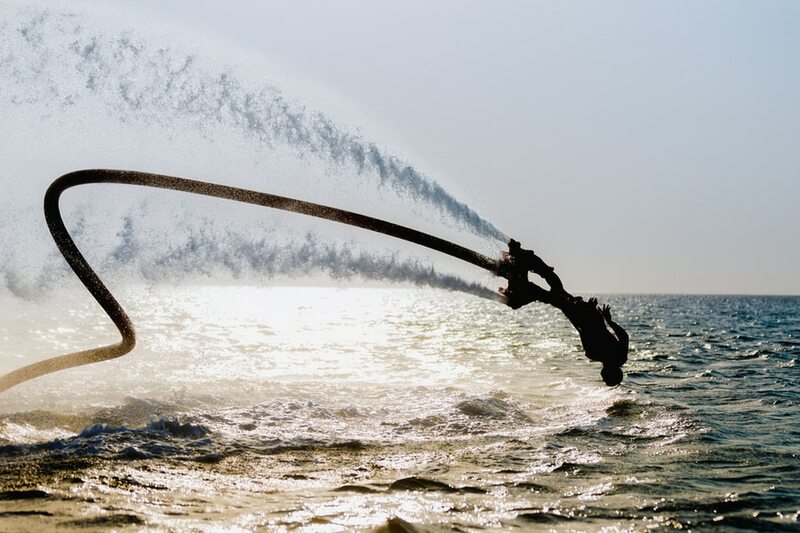 Flyboard is a board like a wake board one brought up in with two pipes which, linked to a jet ski turbaned with a 18 meters pipe, allows its user to highs up to 10 meters from water.